Dr. Daniel Drake Article from the Butler Argus March 26, 1950. 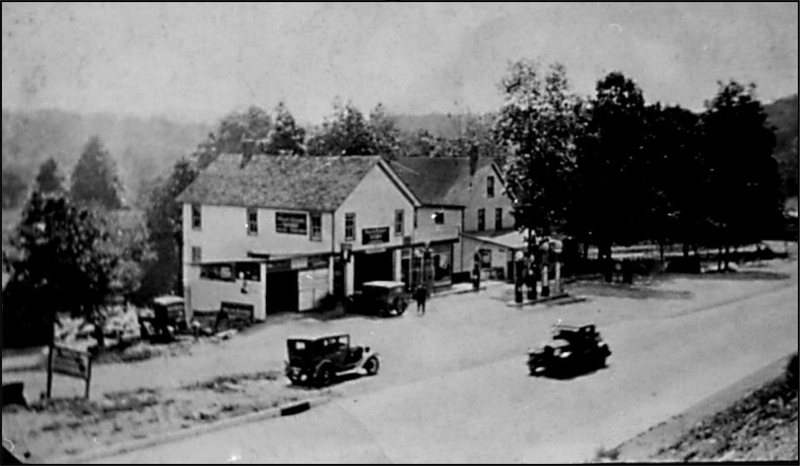 Dr. Drake Owned and Operated Idylease from 1906 until he died in 1951. Thanks to Ron & Andrea Roeser who live in Dr Drake’s former residence for providing me the original newspaper clipping. NEWFOUNDLAND — Sunday will mark the Sixtieth Wedding Anniversary for Dr. and Mrs. Drake of Union Valley Road, Newfoundland. The couple plan to celebrate quietly at their home. Dr. Drake, who is 86, and who has been practicing medicine for For 61 years, can be found every day at his offices at his home and at Idylease Inn, a sanitarium across the road. Idylease opened in 1903, and Dr Drake was appointed president and head of the staff. 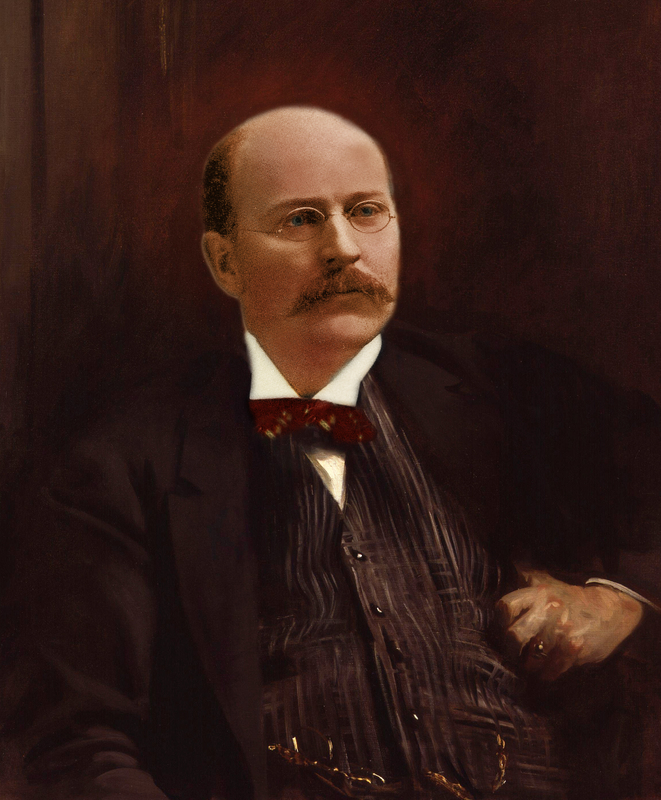 His appointment first brought him and his wife to Newfoundland. He was associated at the time with the late Dr. Edgar A. Day of Brooklyn. Books on medicine became his first interest, while living with his brother, Dr. James Drake of Hancock, N.Y., who encouraged him and financed his five years at the University of Vermont, where he received his degree at the age of 25. Due to a shortage of nurses, patients at the sanatorium are limited to elderly men, who are cared for by male orderlies. This reduced the work at the sanatorium for Dr. Drake, but he is still kept busy with office and outside calls. He is a member of the American Red Medical Association and one of the oldest members of the Passaic County Medical Association. For 40 years he has been president of the Board of Health and for many years president of the American Red Cross local chapter. Mrs. Drake’s hobby is flowers and rare plants. There are 163 plants in the windows of the large colonial house built for the Drakes in 1932. The doctor often assists in the caring of the plants. A picture of one of Mrs. Drake’s prize plants, the “Sansevieria Cylundria,” or “Devil’s Tongue,” was shown in a current magazine, with the history written by her. When the ceremony was over, he and his bride, the former miss Miss Belle M. Walley, hastened back to Equinonk in time for office hours and night rounds. Their first vacation and belated honeymoon came when the doctor was 60 years old. They had their first Florida trip. After that first vacation, the Summer months were spent in a camp in Canada. The Drakes have a daughter, Leonore, at home, and a son, Dr. L. B. Drake of Franklin. 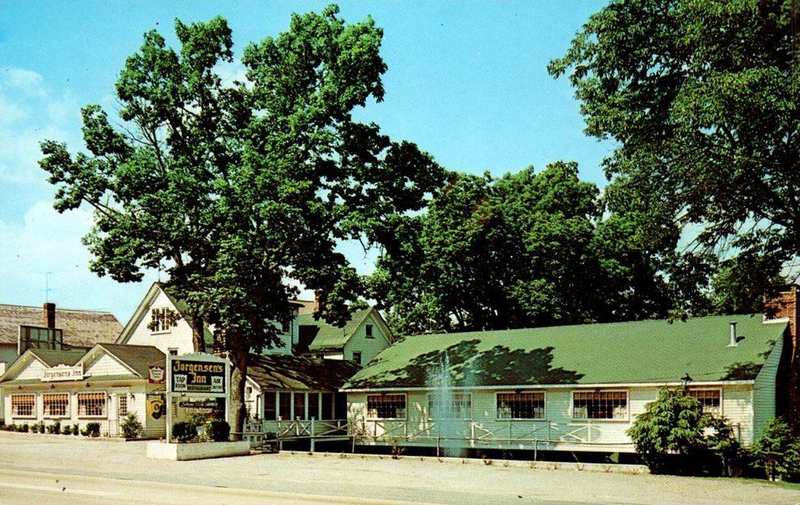 There are two grandsons, William Walley Drake, a student at Harvard University, and Charles Daniel Drake of Bryn Mawr, Pa.
Long time residents of the area may recall Jorgensen’s Inn, the large rambling country restaurant that served bounteous American fare in six antique‐filled dining rooms. It will be remembered as an attractive setting for travelers, skiers and local residents to relax and enjoy a leisurely dinner. 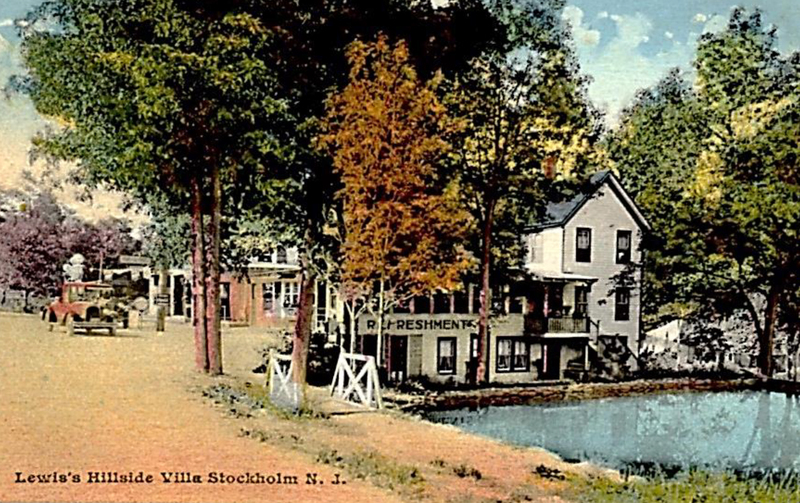 In its heyday during the late 60s thru the early 80s Jorgensen’s was a far cry from the hot dog stand on the old Hamburg‐Paterson Turnpike that first bore the name – Lewis’ Hillside Villa over 90 years ago. 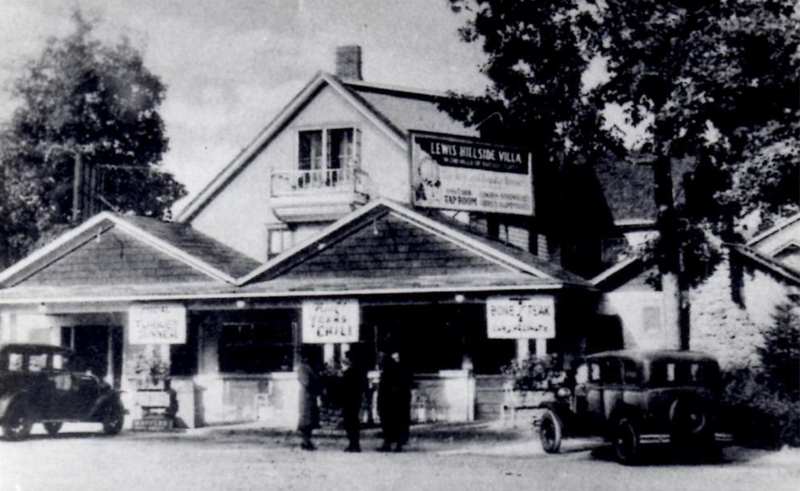 To fully appreciate the history that led to Jorgensen’s, one has to return to around 1926, when George W. Lewis, son of James M. and Josephine Sisco Lewis, acquired a parcel of land formerly owned by Frances M. and George J. Rude. This property was north of the lands of William G. Walker. George had a very spacious three-story frame dwelling built upon the land. His wife, Anne, soon created colorful gardens around the front of the house. George was a very industrious man who had visions of creating a complex to continue operating his repair shop and open a restaurant to accommodate tourists. 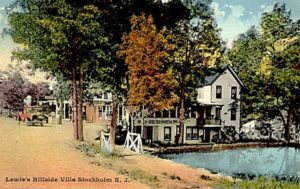 With the advent of the automobile, Stockholm and the surrounding area was increasing in popularity as a destination for motorists traveling on Route 8. (present day State Highway No. 23) George systematically increased the size of the complex and in 1927, he purchased the Walker home and had it moved to his growing conglomerate of buildings. When the Patriotic Order Sons of America Hall property was sold to the City of Newark, he purchased that hall and had it moved to his growing enterprise. Over many years of operation, improvements were made to the buildings. A picnic area, tennis court and swimming pool were added to complex. For many years, the businesses were successful; and he advertised by having postcards made. From the Walther Postcard Collection is this undated postcard. George Walther Lewis was born Dec. 6, 1885 and died Dec. 10, 1945. 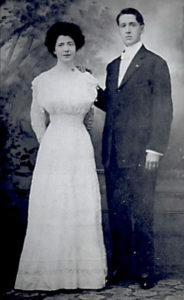 He married on June 15, 1909, Anna E. Gormley, born Aug. 9, 1886, died Aug. 22, 1974. Both were buried at Mt. Calvary Cemetery in Butler. They had three children: Leon W., Llawayne M., and Gerard C. Lewis. Leon Walther Lewis, born Apr. 10, 1911 married on Sept. 17, 1938, Rosa B. Milan, born Mar. 26, 1918. He was an electrician and TV repairman. They lived in Lake Stockholm. Their children were: Georgeanna, born Sept. 25, 1941, married, later divorced, James Fernandez, their children were Lisa A., and Raymond L. Fernandez; Rita M., born June 1, 1945, married George D. Wildrick Sr., their children were George D. Wildrick Jr. and Jennifer; and Rosemary, born July 2, 1947, married Thomas H. Davies, Sr., and their children were Thomas H. Davies, Jr. and Patricia L. Davies. The author had several visits with Leon Lewis in February 1977. He graciously shared his family history and allowed the author to make copies from the family photo collection. Llawayne Marie Lewis, born May 4, 1912, married Daniel Dietz, born Sept. 24, 1912 and their children were: Daniel Jr., Donald and Diann M. Dietz. Gerard Clifford Lewis, born May 27, 1913, married Alameda Flood born Apr. 10, 1918, they had no children. They lived at Lake Stockholm. 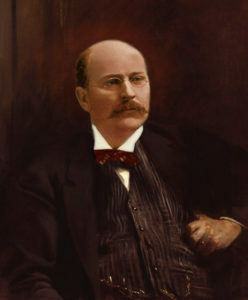 Gerard C. Lewis provided a family tree of the Lewis family. After George Lewis’ death, Anna sold the restaurant business to Mr. and Mrs. Martin McDonough in March 1946. Gerard Lewis served in World War 11, and returned to Stockholm on June 21, 1948. He purchased the garage business from the McDonough’s. Gerard successfully operated the business until 1966 when he sold it to Ray Fowler. The title then passed to Richard Jorgensen. The Jorgensen’s remodeled the entire complex that was to be used solely as a restaurant. The restaurant has had successive owners who operated the restaurant. Happy New Year from Idylease. It’s our 115th Birthday. 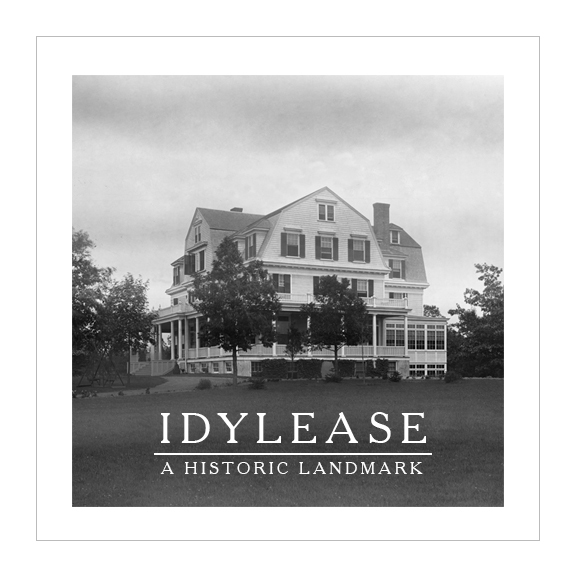 Idylease first opened her doors to the public on New Year’s Day in 1903. 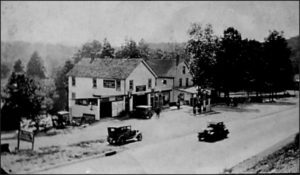 We are celebrating 115 years as West Milford’s most noted Historic Landmark. Here’s wishing you all the joy of the season. Have a happy new year!